Be a part of a legacy when you explore The Last Frontier with Holland America Line. 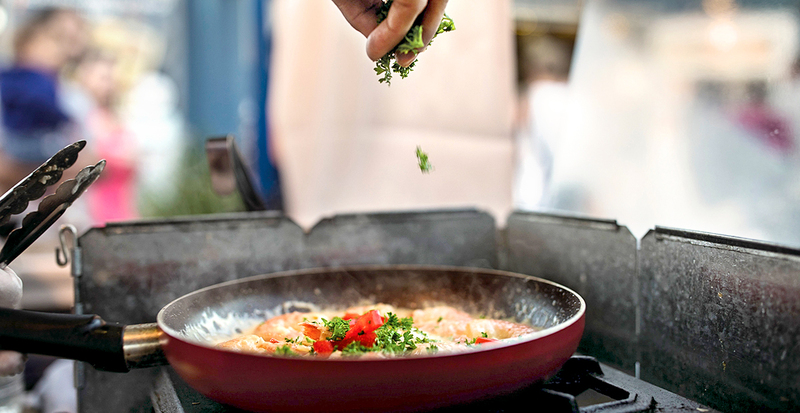 Take time to slow down and dine your way through Vancouver. Style meets function aboard the brand-new Celebrity Edge. Your dreams of a picture-perfect beach vacation become reality at Dreams Resorts & Spas. Cruise into Northern European history with Silversea. Take your travels beyond the Great Barrier Reef when you spend more time exploring Brisbane and Cairns. Peer into modern galleries and enduring museums that define South Africa’s art scene. See the world anew from the doorstep of the most luxurious hotels and resorts. Stretching across northeastern Australia’s coast, Queensland is intrinsically connected to the Great Barrier Reef that lies just beyond its shores. Yet on either end of the coast are two cities that each flaunt their unique vibe: sophisticated Brisbane with its booming art and culinary scene and relaxed Cairns, where nature and urban life blend seamlessly. World traveler Cathy Brown, who explores Australia frequently on her adventures, reveals some of her favorite discoveries. On the South Bank of Brisbane’s wending river, a treasure trove of culture awaits your arrival. Less than 500 feet apart stand the Queensland Art Gallery and Gallery of Modern Art (QAGOMA), each presenting engaging perspectives of contemporary art of Australia, Asia and the Pacific. 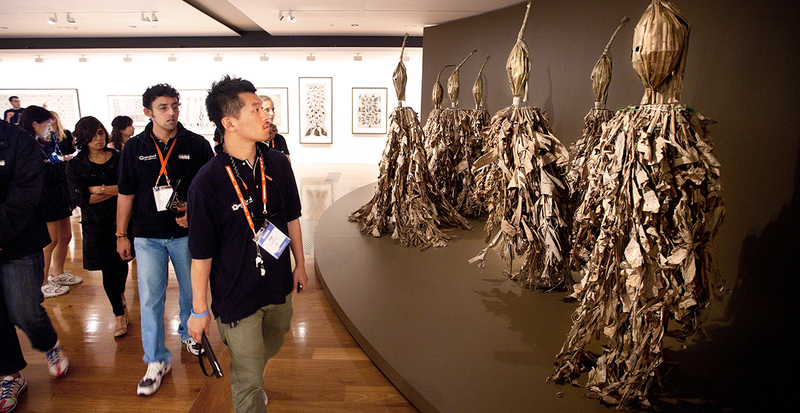 Step into the halls where the art of Torres Strait is currently on display as island artists share the inspiration of their natural surroundings through intricate wood and lino-block carvings. 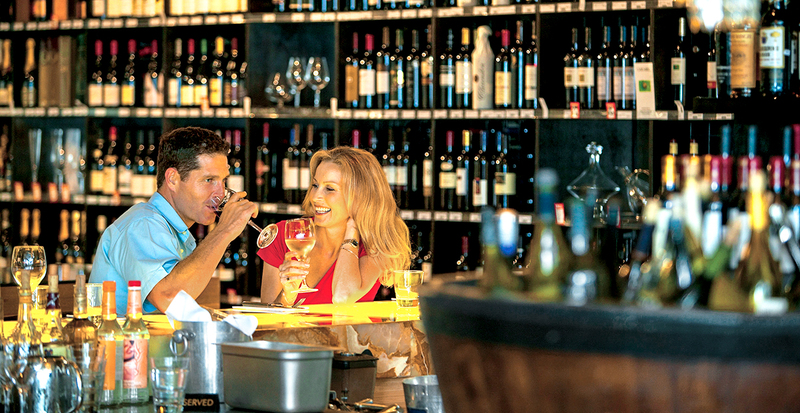 Honoring local ingredients through fresh, simple cuisine, Brisbane has long been celebrated as a culinary mecca. At Locavore, meat comes from the Darling Downs area, fish from Tweed River, berries from Caboolture, milk from Maleny and organic eggs from Echo Valley. Miel Container took the traditional burger, added some funky Asian influence and quickly made its unpretentious shipping container location the place to grab a casual “bit of tucker” in town. And Eat Street Markets is a fun medley of stalls and eateries in a shipping container terminal by the water. While international couture is easy to find in Brisbane’s malls, it’s the small boutiques and shop-lined lanes that will draw you into this eclectic city. Stroll the area of Fortitude Valley along its “shopping trail” to seek out local designs, while the Woolloongabba suburb is where to go for for antiques. Paddington is stocked with homewares, books and vintage fashion. The Collective Markets in the historical precinct of Stanley St. Plaza is a fun, quirky place to search for a memorable one-off item, from vintage clothing to arts and crafts. Cairns (pronounced “Cans”) was once a humble port town, but as it’s the last stop before you venture into the beauty of the Great Barrier Reef, it has developed its own distinctive personality. It has a thriving café scene — try a coconut latte at Caffiend or Nutella ice coffee at Silk Caffe. 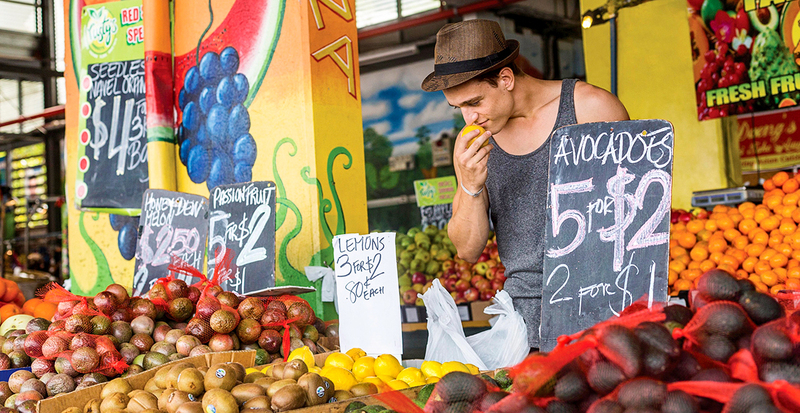 Cairns’ balmy weather is perfect for perusing Rusty's Markets on the weekend, where you can stock up on exotic fruits, dairy and seafood from more than 180 stalls. Just 20 minutes outside of Cairns, you can explore the history of the world’s oldest living culture at the Tjapukai Aboriginal Cultural Park. Peer into the living history of this indigenous culture that has inhabited this region for more than 40,000 years through guided bush walks, didgeridoo performances and mesmerizing campfire dances. For a deeper exploration into nature, the World Heritage-listed Daintree Rainforest is a two-hour drive north of Cairns — offering a privileged glimpse into the most diverse range of plants and animals on earth, including the rare tree-dwelling kangaroo and the endangered cassowary. Before checking off the Great Barrier Reef from your lifelong wish list, carve out time on land to explore the cultural beauty of Queensland’s vibrant coastal cities. Get ready for Queensland when we create your Australia vacation.